The Package Pass thru with Steel Doors is designed for the transfer of larger items. thru walls . A special interlocking mechanism between the interior and exterior door allows only one door to be opened at a time. A separate bar lock for the exterior door can be activated from the inside. A closer is furnished on the exterior door. The unit will mount in walls up to 11-1/2 inch (292 millimeter) thick, and requires a 15-1/2 inch (394 millimeter) wide x 15-1/2 inch (394 millimeter) high wall opening. 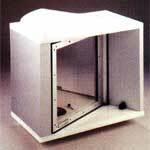 They feature a 12 inch (305 millimeter) wide x 10 inch (254 millimeter) high vision panel in the interior door. This enables the operator to see the contents inside the unit. The level one unit is glazed with 1-1/4 inch (44 millimeter) acrylic. 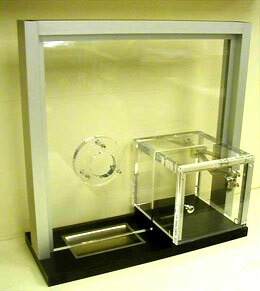 Clear Package Transfer Unit is designed for interior use only. Satin finish aluminum extrusions are used to fasten the sides and bottom together. Bottom is constructed of plywood and bullet resistant fiberglass covered with plastic laminate. A special interlocking mechanism allows only one door to open at a time. Closer furnished on customer side door. 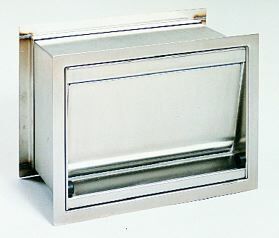 All stainless steel Pass Thru mounts on counter top, in wall or window opening. as well as two-liter size beverages. 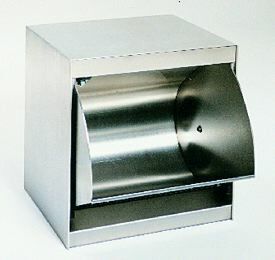 All stainless steel Pass Hopper mounts on counter top, in wall or window opening. Hopper pivots outward for customer access, then in opposite direction for operator access. Only one moving part allows virtually maintenance free service. Pass Hopper is equipped with weather strip for exterior use. Standard models provide Level I bullet resistant protection. Level III protection is an extra option. Pass Hopper is available with stationary exterior flange and loose adjustable flange for rear side on all models. This is the Largest Pass Hopper provides ample capacity for large bulky items. moneybags, keys, gallon containers such as milk or anti-freeze, cartons of cigarettes as well as two-liter size beverages. This single light window unit is for interior use only. Window has a natural voice transmission unit. Deal tray is provided for currency transactions while package passer handles larger items for transfer. Choice of plastic laminate on shelf. Choice of glazing. Frame available in clear or dark bronze anodized finish. This double light window unit is for interior use only. 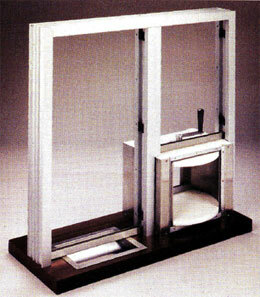 Window has natural voice transmission inside aluminum frame. 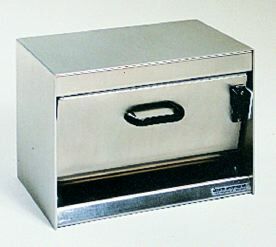 Deal tray is provided for currency transactions while Lazy Susan pass thru handles larger items for transfer. Choice of plastic laminate on shelf. Choice of glazing. Frame available in clear or dark bronze anodized finish. Overall size is 36" wide x 36" high. Lazy Susan for interior use only, available in ballistic level I, allows plain view of contents. provides bullet resistant protection while holding energy loss to a minimum. It allows no direct entry of outside air into the building.